Keukenhof Portiere II shows a scene from the expansive gardens in Holland. Full of tulips, this garden is one of the largest in Europe. Here we see orange red tulips in the foreground in front of the lake and the deep green tree foliage beyond. The wall hanging is in the style of a portiere, the narrow and long wall hangings, used to adorn castle and palace chambers. 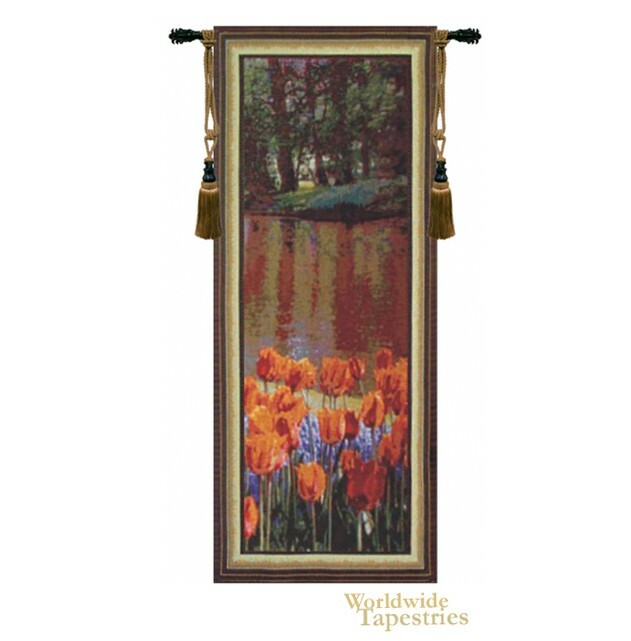 This Kuekenhof Portiere II tapestry is backed with lining and tunnel for easy hanging. Note: tapestry rod and tassels, where pictured, are purchased separately. Dimensions: W 30" x H 67"